I have always been very excited by mountains, and especially mountains in the immediate proximity of cities. I lived in Santiago, Chile until the age of 5, and though I have very few memories of it, something of the drama of the Andes rising up incredibly next to the city must have stayed with me. Mountains, especially near cities, seem to me animate, protecting beings. Sometimes, when a bank of clouds fills the sky above the horizon, I imagine that they are very high mountains looming impossibly close and I think, wouldn’t that be so exciting? It’s the best I can do in New York. 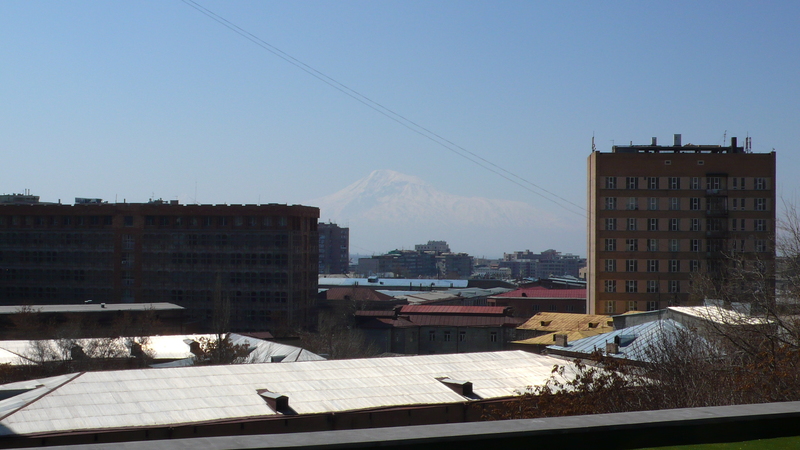 So I was happy when I landed in Yerevan, Armenia, and looked out my airplane window to see Ararat–so handsomely formed, so starkly set out, the Fuji of the West. 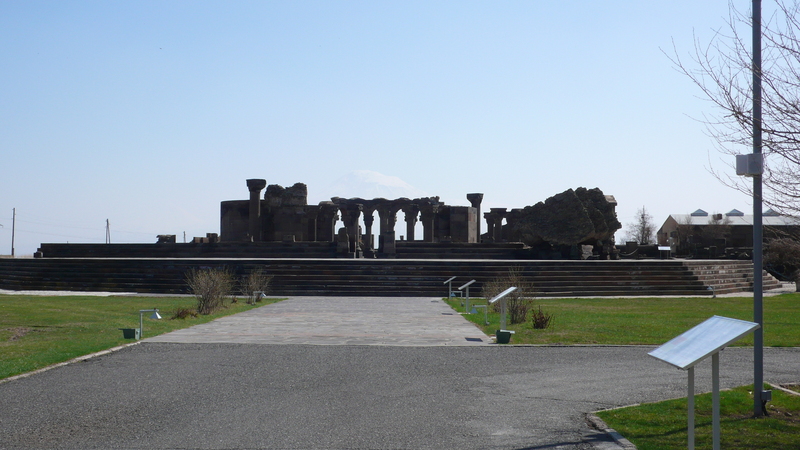 I knew it was not far from Yerevan but had no idea that it rose up near the city like a presiding deity. 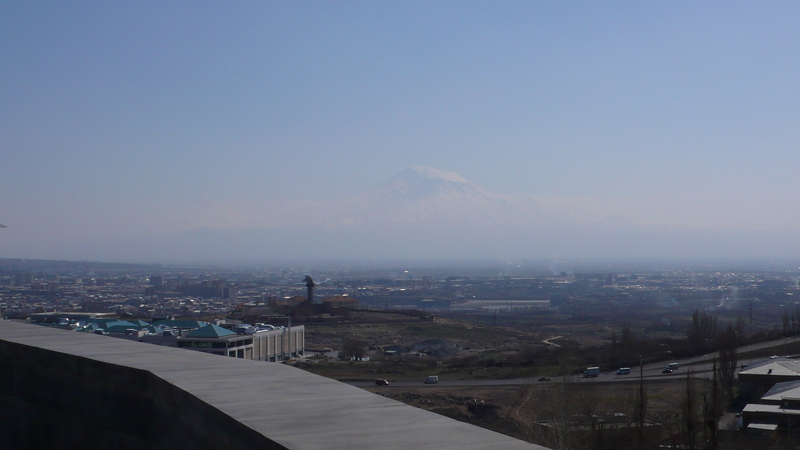 But, almost as if to preserve its virtue, or to protect us from over-exposure to its power, or simply because such staggering things shouldn’t be too readily available, Ararat is most often shrouded in mist, its outlines only faintly visible. What is barely discernible to the naked eye becomes almost completely illegible in a photo. Here are some efforts I made. I swear it is there, in the middle of each shot. Here it is peaking above the rooftops, from my hotel window. Armenians call it Masis. (That is “little Masis” to the left.) This was the clearest day I had, as it turns out. Here it is from the steps of the National Library. Here it is, from the Genocide Memorial, just outside the city. Here it is behind the monastery of Khor Vrap, steps from the Turkish border. 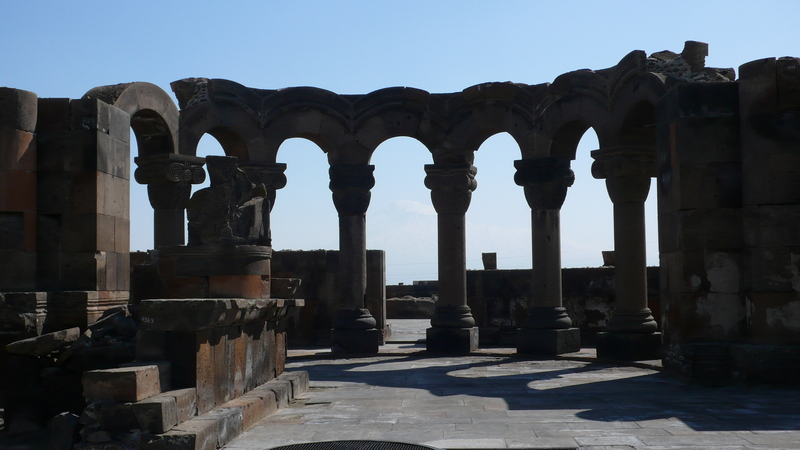 I visited some amazing churches, but perhaps the most incredible of all, Zvartnots, is in ruins. 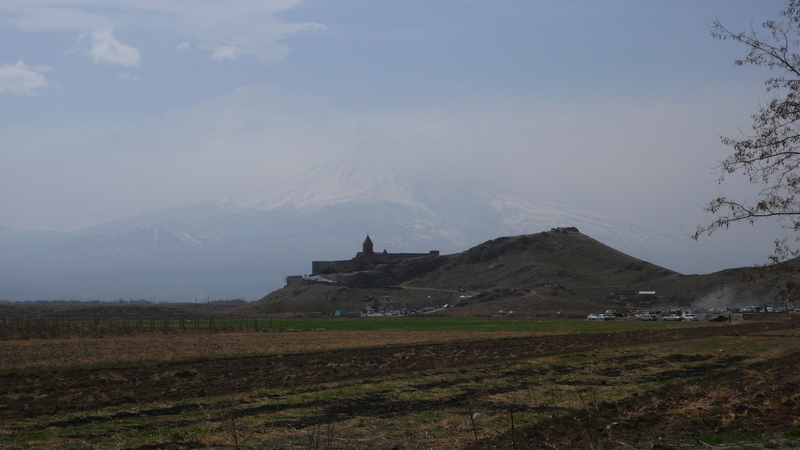 It now looks like an Armenian Stonehenge, and its ring of colums is beautifully centered on Ararat. Take my word for it, it is right in the middle here, rising to the level of the column capitals! Locals say it is clearly set against a limpid sky only about 60 days out of the year. Its appearing and disappearing quality, its Verschwindlichkeit, reminds one that when the waters receded after the great flood, it was the first land mass to appear. Or, more rationally, the fact that it is usually shrouded in a sea of mist may be what has compelled belief that this must be where Noah’s ark struck land. 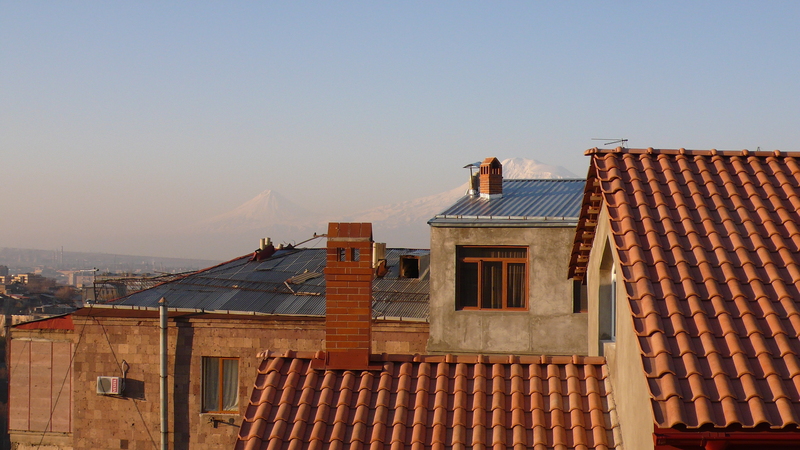 On a more contemporary note, Ararat embodies what the Armenians lost to Turkey in the early part of the 20th century. They always say “our mountain” even though it is now, inconveniently, across the border. Always powerfully present, occasionally starkly visible, usually hovering at the threshold of invisibility, it is a fitting enough figure for memory itself.